Introduction Cigarette price increases prevent youth initiation, reduce cigarette consumption and increase the number of smokers who quit. Cigarette minimum price laws (MPLs), which typically require cigarette wholesalers and retailers to charge a minimum percentage mark-up for cigarette sales, have been identified as an intervention that can potentially increase cigarette prices. 24 states and the District of Columbia have cigarette MPLs. Methods Using data extracted from SCANTRACK retail scanner data from the Nielsen company, average cigarette prices were calculated for designated market areas in states with and without MPLs in three retail channels: grocery stores, drug stores and convenience stores. Regression models were estimated using the average cigarette pack price in each designated market area and calendar quarter in 2009 as the outcome variable. Results The average difference in cigarette pack prices are 46 cents in the grocery channel, 29 cents in the drug channel and 13 cents in the convenience channel, with prices being lower in states with MPLs for all three channels. Conclusions The findings that MPLs do not raise cigarette prices could be the result of a lack of compliance and enforcement by the state or could be attributed to the minimum state mark-up being lower than the free-market mark-up for cigarettes. Rather than require a minimum mark-up, which can be nullified by promotional incentives and discounts, states and countries could strengthen MPLs by setting a simple ‘floor price’ that is the true minimum price for all cigarettes or could prohibit discounts to consumers and retailers. Cigarette minimum price laws (MPLs), also known as cigarette fair trade laws, have recently been identified as a policy intervention with the potential to counteract trade discounts, thereby protecting the fidelity of excise taxes by maximising their impact on cigarette prices.7 ,11 ,13 ,14 It is possible that MPLs, when working in concert with excise tax increases, can prompt more smokers to quit and prevent more youth from initiating smoking than if the increase in the price of cigarettes had been blunted by price discounts. MPLs set the lowest legal price for the wholesaler to sell to the retailer and retailer to sell to the consumer. These laws are typically designed to require a minimum mark-up, which is assumed to be the minimum cost of doing business, to be added to the wholesale and retail price of cigarettes after all excise and sales taxes have been added. The MPLs in two states (Rhode Island and Washington) do not require a percentage mark-up for wholesale or retail and instead set the minimum price as the ‘replacement cost’ and ‘actual price paid’, respectively.13 Laws in those two states prohibit cigarettes from being sold at a loss of revenue (eg, wholesaler may not sell at less than invoice price, retailer may not sell at less than wholesale price). MPLs may also prohibit or allow discounts from being included in the minimum price calculation.13 Many states with MPLs publish a list of the minimum prices for cigarettes, by brand, and often make such list available on a state government website. In 2010, the Centers for Disease Control and Prevention13 (CDC) published a study that identified the wholesale and retail mark-ups for the 24 states and District of Columbia that have MPLs for cigarettes. The study also identified whether discounts were prohibited from being considered in the minimum price calculations. The CDC found only seven MPLs expressly prohibited the use of trade discounts in the minimum retail price calculation, potentially allowing the 18 other states without such restrictions to sell cigarettes below what would otherwise have been the statutory minimum price.13 The study by Feighery et al 11 and CDC13 called for future research using a larger sample of states to examine whether MPLs affect cigarette prices. The purpose of our article was to compare the retail price of cigarettes in locations with and without MPLs and to assess whether MPLs increase retail cigarette prices. Information on MPLs was extracted from CDC's study, which identified MPLs that were effective on 31 December 2009.13 No state amended, repealed or enacted a new MPL during 2009; therefore, these laws were in effect during the entire study year. The characteristics of MPLs included in this analysis are as follows: the minimum percentage mark-up for cigarette wholesalers, the minimum percentage mark-up for cigarette retailers and any statutory provision specifically prohibiting trade discounts from entering the minimum price calculation. Minimum price states that explicitly prohibit trade discounts by statute were considered to have ‘strong’ MPLs; those without such prohibition were considered ‘weak’ MPLs. Cigarette prices and sales in 2009 are from SCANTRACK retail scanner data from the Nielsen company (Nielsen, New York City, New York, USA) for three retail channels separately: grocery stores, drug stores and convenience stores. The designated market area (DMA) is the geographic unit for which SCANTRACK data are reported. A DMA is a collection of counties containing a metropolitan area and are often quite large. The average number of counties in a DMA is 30 (minimum: 1, maximum: 79), and the average population is 4.6 million people (minimum: 1.1 million, maximum: 20.3 million). The number of DMAs for which data are provided differ by retail channel: 52 for grocery stores, 11 for drug stores and 25 for convenience stores (table 1). DMAs often do not conform to state boundaries. For example, of the 52 grocery store DMAs, 33 contain counties from two or more states and 19 contain counties from three or more states. Ideally, the scanner data markets would conform entirely within a state's boundaries and classifications for MPLs; however, they did not correspond and we adjusted our analysis accordingly. County population data for 2009 were obtained from the US Census and merged to each DMA. This allowed the calculation of total DMA population, as well as the proportion of a DMA's population that resides in each state. By calculating the distribution of each DMA's population across states, we were able to code all DMAs into one of the two categories, with respect to cigarette MPLs. A DMA was coded as having an MPL if a majority of its population resided in a state with an MPL. A DMA was coded as non-minimum price if there was not an MPL in the state or a majority of the DMA's population resided in a state without an MPL. Table 2 provides an alphabetical listing of all 52 SCANTRACK DMAs, showing the states that each market intersects and distribution of counties and population within the market by state. All available SCANTRACK DMAs are included in the analysis, with the exception of District of Columbia, which is excluded because it includes parts of six states, with varying MPLs. The result is that the DMA has 42% of its population in a state with a weak MPL, an additional 19% in a state with a strong MPL and 39% in a state with no MPL. Given this dispersion of population across this DMA, we felt that it was not possible to accurately assess the effect of MPLs for this DMA. In addition to the minimum price status of each DMA that is listed, table 2 also lists whether the DMA had a strong MPL (MP-strong) or weak MPL (listed as MP in the table). A DMA was identified as strong if a majority of the DMA encompassed jurisdictions with MPLs that prohibit inclusion of trade discounts in the minimum price calculation. New York (64% MP-strong) and Philadelphia (67% MP-strong) were the only MP-strong DMAs where <80% of the DMA's population was contained in a state with a strong MPL; however, in both instances, 100% of the DMAs were contained in states with an MPL (table 2). The wholesale, retail and total minimum price mark-up in effect in a DMA was calculated using a weighted percentage of the state mark-ups and population proportions as weights. Cigarette excise taxes vary considerably by state and are a significant determinant of cigarette price. Therefore, this study excludes state cigarette excise taxes from the cigarette price for all DMAs (SCANTRACK data are already net of sales tax). In DMAs with an MPL, the excise tax amount to be removed was adjusted for wholesale and retail mark-ups using a methodology similar to that of the previous study of 15 states.11 First, for each state with an MPL, the effective excise tax was calculated as state excise tax × (1+ wholesale mark-up) × (1+ retail mark-up), where both mark-ups are percentages expressed as fractions between 0 and 1. Next, the effective excise tax in every DMA was calculated as a weighted percentage of state effective excise taxes, using the proportion of the population that resides in each state intersected by the DMA as the weights. For DMAs that include areas with local cigarette excise taxes (eg, New York City, Chicago–Cook County), those areas were accounted for with a combined excise tax equal to the population-weighted sum of the state and local taxes. For each DMA, we calculated total dollar sales for cigarettes net of effective excise taxes by subtracting the tax calculated in the previous step times total pack sales. Finally, net dollars were divided by total pack sales to arrive at the average price per pack, net of marked-up cigarette excise taxes, for DMAs with an MPL. For example, in the Hartford DMA, 78% of the market's population lives in Connecticut and 22% lives in Massachusetts. Connecticut's US$3.00 cigarette tax adjusts to US$3.451 after accounting for the state's 6.5% wholesale mark-up and 8% retail mark-up (US$3.451= US$3.00×1.065×1.08). Similarly, Massachusetts's per pack tax of US$2.51 yields an effective tax of US$3.224 once scaled for wholesale and retail mark-ups of 2.75% and 25%, respectively (US$3.224= US$2.51×1.0275×1.25). The average of the two adjusted state taxes, weighted by the proportion of the market in each state, produces an effective per pack tax of US$3.401 for the DMA as a whole (US$3.401= US$3.451×0.78+ US$3.224×0.22). In the fourth quarter of 2009, 45 149 packs were sold in Hartford grocery stores for a sales total of US$324 499. Using the effective market tax per pack of US$3.401, an estimated US$153 553 (=45 149×US$3.401) of that sales total would come from taxes, with the remaining US$170 946 representing net dollar sales of cigarettes for that quarter. Dividing net sales dollars by pack sales yields an average net price of US$3.79 (= US$170 946/45 149) for Hartford DMA grocery stores in Q4 2009. Net sales dollars for non-promoted cigarettes were used in the calculation of cigarette prices. Prices for all other markets, channels and quarters were calculated using these same steps. Because the enforcement of an MPL can impact the law's effect on cigarette prices, a small qualitative study was also undertaken. A convenience sample of state employees involved in compliance and enforcement of state MPLs were contacted by telephone to gather information about the enforcement of MPLs. State employees were contacted from the five MP-strong states that were included in this study (Arkansas, Minnesota, Nebraska, New York and Pennsylvania) and the state with the highest required percentage mark-up (Massachusetts). The respondents were asked how the MPL is enforced, the number of violations that occur per year and the number of citations with fines that are issued per year in their states. 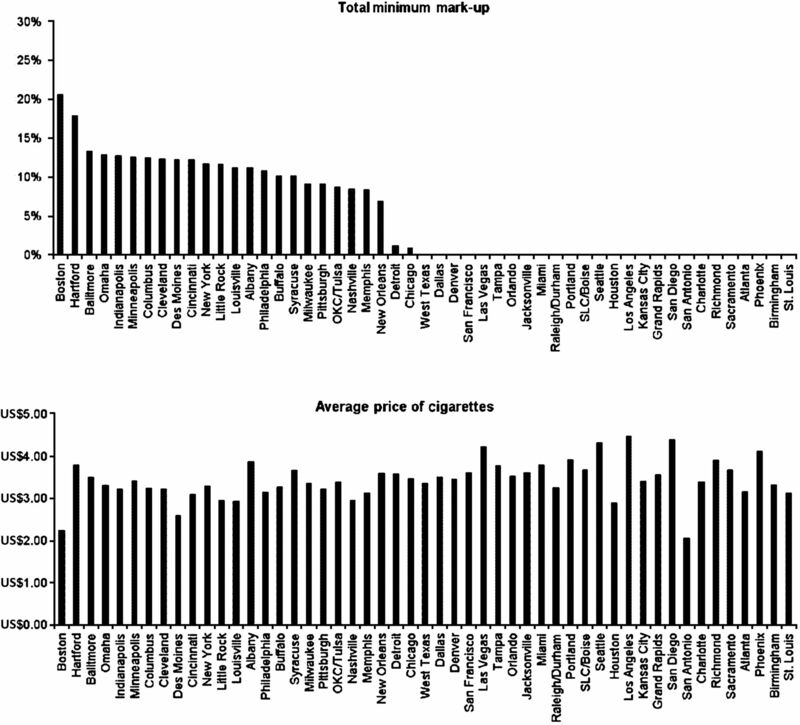 Average cigarette prices for each group of DMAs were calculated for states with and without MPLs (as described above) for grocery stores, drug stores and convenience stores. Ordinary least squares (OLS) regression models were estimated using the average price of a pack of cigarettes in each DMA and calendar quarter in 2009 as the outcome variable. Explanatory variables included an indicator for the minimum price status of the DMA (MP =1, non-MP =0) and indicators for each calendar quarter of 2009 (quarter 1 being the omitted quarter). County-level data from the US Census Bureau were used to construct DMA-level measures for the unemployment rate (per cent, measured from 0 to 100), median household income (in US$10 000 units, per year) and per cent of the DMA population that is non-white (per cent, measured from 0 to 100). Figure 1 includes a chart that compares the average minimum mark-up for each grocery store DMA (upper) and a chart of the price of a pack of cigarettes (lower), net of cigarette taxes, in each grocery store DMA. Figure 1 is sorted in descending order of their total minimum price mark-up. If MPLs acted in a strong, systematic way to increase average cigarette prices, there would be higher average prices in markets with MPLs compared with markets without such laws, with highest prices occurring in markets with the higher minimum mark-ups. However, figure 1 does not reveal any pattern of cigarette prices with respect to the total minimum mark-up. Average minimum price mark-up and price per pack of cigarettes (net of taxes) in grocery stores, markets sorted by descending minimum price mark-up, 2009. Table 3 presents average cigarette pack prices, net of cigarette excise taxes, for DMAs with MPLs and with no MPLs, by calendar quarter for 2009 in all three retail channels for which SCANTRACK data are available. The table presents average prices for DMAs with MPLs when compared with DMAs without MPL, as well as when comparing the prices in strong, weak and non-minimum price DMAs. When only comparing DMAs with and without MPLs, and not considering if an MPL was strong or not, average prices were highest in non-minimum price DMAs for all three channels. The average difference in cigarette pack prices between minimum price and non-minimum price DMAs are 46 cents in the grocery channel, 29 cents in the drug channel and 13 cents in the convenience channel, with prices being lowest in minimum price DMAs for all three channels. When the analysis was expanded to account for DMAs with strong and weak MPLs, the results were mixed. For the grocery channel, prices were highest among DMAs without MPLs, with average prices being lowest in DMAs with weak MPLs. For the drug channels, average prices were highest among DMAs with weak MPLs, with average prices being lowest in DMAs with strong MPLs. For the convenience channel, average prices were highest, depending on the quarter, in the DMAs with a weak MPL or without MPL; however, average prices were lowest among DMAs with strong MPLs for all quarters in this channel. Table 4 reports the results from the regression analyses of average cigarette prices, measured in dollars per pack, by channel. The minimum price market is the key explanatory variable and dummy coded as 1 in minimum price DMAs and 0 otherwise. The pattern of coefficients for the minimum price market variable mirrors the pattern of price differences reported in table 3. The coefficient of −0.215 (p<0.01) for grocery stores implies that cigarette prices in minimum price markets are 21.5 cents lower than prices in non-minimum price markets. For drug stores, the coefficient is marginally significant (p<0.05) and implies a difference of 24.8 cents per pack between minimum price and non-minimum price markets. The price difference of 9.6 cents in convenience stores is not statistically significant. When the regression model was modified to account for the different categories of MPLs in this paper (strong, weak and none), the results do not change the main conclusion of the paper, as average cigarette prices are lower in DMAs that have MPLs in effect (results not shown). Because DMAs do not conform to state boundaries, we also developed estimates using the fraction each DMA's population that resides in a state with an MPL, as derived from the fractions contained in Table 2, to test the sensitivity of our findings. Results from this supplemental regression analysis (not shown) were virtually unchanged when compared with the results presented in the paper where the MPL was coded with a 0/1 indicator. For the qualitative analysis, respondents were identified in all six of the states that were contacted. All six of the states that were interviewed indicated that there were few MPL violations reported each year, ranging from fewer than 30 per year in New York and Pennsylvania to fewer than 100 in Massachusetts. Staff from Nebraska and Massachusetts indicated that there were no citations issued in the most recent year, and staff in Pennsylvania indicated that while there are approximately 30 citations issued per year, there are no associated fines. Only staff from Arkansas and New York indicated that they proactively investigate violations, as the other states rely on external reports for violations (eg, reports from competitors). Additionally, Arkansas was the only state contacted that identified levying fines, with 16 citations being issued from 68 violations. The data suggest that current MPLs do not result in higher cigarette prices, as this study found average cigarette prices were lowest in DMAs with MPLs. Feighery et al 11 did not find statistically significant differences in the average prices for Marlboro and Newport brand cigarettes in states that had an MPL, that study did find higher prices in New York and the authors credited that success to the state having a ‘strong’ MPL. The null findings of our study on the effect that MPLs have on cigarette prices could be related to several factors. One reason for the null findings is that compliance might be low. A properly implemented and enforced policy might be effective in raising prices, but there could be an implementation failure among current MPL states. The states that we contacted reported most laws being enforced passively and without meaningful penalties for retailers who sell cigarettes to consumers below the statutory minimum price. The compliance rate is also unknown because it could not be assessed with scanner data. For instance, it is possible that stores are selling cigarettes below the allowable minimum price and the lack of enforcement has allowed them to do so undetected or without penalty. Another reason for the null findings might be that the minimum mark-up required by MPLs is lower than typical free-market mark-up for cigarettes. For instance, the National Association of Convenience Stores reported that the average retail mark-up of cigarettes in 2007 was 18%, above the median statutory minimum retail mark-up of 8%.16 Therefore, it is likely that MPLs formulas would need to be substantially higher to be effective in increasing cigarette prices. Our study has several limitations. One limitation is that DMAs often span multiple states and may contain a mix of counties with different MPL status. This would tend to lower the contrast between areas with MPLs and areas without them. However, as table 2 shows, the correspondence between DMAs and MPLs is closely related, with most DMAs having the overwhelming majority of its population in one type of area. Another limitation to the analysis is that the number of DMAs available for the three retail store types is unbalanced, with 52 for grocery, 25 for convenience and 11 for drug (table 1). Thus, comparisons of results for the three channels should be made with caution. A third limitation is that each state MPL has been categorised as strong or weak based on the state's statute. Other factors not considered in this study may also have an impact on the strength of a state law, including, any regulation or policy set by the state agency with enforcement authority and any enforcement actions taken by the state. Furthermore, while we controlled for state cigarette excise taxes, tax increases occurred during the study period in 13 states (Arkansas, Connecticut, Delaware, Florida, Kentucky, Mississippi, North Carolina, New Hampshire, New Jersey, Pennsylvania, Rhode Island, Vermont and Wisconsin), potentially increasing pricing strategies by cigarette companies in these states. Additionally, the Federal excise tax increased on 1 April 2009; however, because this resulted in a price increase that affected all states and DMAs equally, and our study examines differences between DMAs, it was not necessary to control for the Federal excise tax. Although this study finds that current MPLs do not result in higher cigarette prices, this does not necessarily mean that MPLs should be abandoned as a potential tobacco control strategy. Because increasing the price is one of the most effective tobacco prevention strategies, it is important to minimise the impact cigarette manufacturers have on reducing the price of cigarettes. States could take steps to adjust the approach of existing or new MPLs to fully support enforcement and compliance. For example, setting a simple ‘floor price’ or flat rate minimum price based on alcohol content has been proposed in England, Scotland and Wales,17 ,18 based on the evidence that it will increase the price of beer and alcohol and reduce consumption and related harm.19 Other countries and the USA could consider a similar approach and set a flat rate minimum price for all cigarettes, regardless of their wholesale price. A single minimum price could make enforcement easier and would eliminate low-cost cigarettes from the retail market regardless of cigarette manufacturer action (eg, discounts). Currently, at least 18 of the states with MPLs allow promotional incentives to be considered in their minimum price formula, thereby effectively lowering what could otherwise be a higher statutory minimum price.13 However, it is unclear from our results if current MPLs, which prohibit discounts from being considered in the minimum price calculation, are actually effective, as they do not appear to substantially increase cigarette prices. Furthermore, it is important to understand unintended consequences of MPLs, which could benefit the tobacco industry or retailers through increased profits.7 Furthermore, it is possible that the existence of an MPL provide cigarette retailers with an opportunity to advertise that they are selling products at the lowest legal price. Given the findings in our study, any enhancement of a state MPL is experimental and therefore should be enacted first with the intention of carefully evaluating the anticipated and unanticipated impact the change may have on cigarette prices, sales and consumption. MPLs have been identified as a non-tax strategy to potentially raise the price of cigarettes. This study is the first to examine the impact that state cigarette MPLs have on a large sample of communities with MPLs. The findings reveal that states with cigarette MPLs do not have higher cigarette prices when compared with states without MPLs. These findings underscore the importance of continuing to research alternative ways to mitigate the impact that the tobacco industry has on reducing the retail price of cigarettes. US Department of Health and Human Services. Surgeon General's Report: Reducing Tobacco Use. Atlanta, Georgia: US Department of Health and Human Services, Centers for Disease Control and Prevention, Office of Smoking and Health, 2000:337–59. Institute of Medicine. Ending the Tobacco Problem: a Blueprint for the Nation. Washington, DC: The National Academies Press, 2007:182–9. World Health Organization. WHO Report on the Global Tobacco Epidemic, 2008–the MPOWER package. Geneva, Switzerland: World Health Organization, 2008.
. Effectiveness of tax and price policies in tobacco control. Tob Control 2010;20:235–8.
. Tax, price and cigarette smoking: evidence from the tobacco documents and implications for tobacco company marketing strategies. Tob Control 2002;11(Suppl i):I62–72.
. Tobacco industry price-subsidizing promotions may overcome the downward pressure of higher prices on initiation of regular smoking. Health Econ 2005;14:1061–71.
. Tobacco Retail Price Manipulation Policy Strategy Summit Proceedings. Sacramento, CA: California Department of Public Health, California Tobacco Control Program, 2009. http://www.cdph.ca.gov/programs/tobacco/documents/ctcppricestrategysummit2009.pdf (accessed 5 Apr 2012).
. Role of slotting fees and trade promotions in shaping how tobacco is marketed in retail stores. Tob Control 2001;10:340–4.
. How the tobacco companies ensure prime placement of their advertising and products in stores: interviews with retailers about tobacco company incentive programmes. Tob Control 2003;12:184–8.
. Retailer participation in cigarette company incentive programs is related to increased levels of cigarette advertising and cheaper cigarette prices in stores. Prev Med 2004;38:876–84.
. How do minimum cigarette price laws affect cigarette prices at the retail level? Tob Control 2005;14:80–5. Centers for Disease Control and Prevention. State cigarette minimum price laws—United States, 2009. MMWR Morb Mortal Wkly Rep 2010;59:389–92.
. Research gaps related to tobacco product marketing and sales in the Family Smoking Prevention and Tobacco Control Act. Nicotine Tob Res 2012;14:43–53.
. Cigarette purchase patterns in four countries and the relationship with cessation: findings from the International Tobacco Control (ITC) Four Country Survey. Tob Control 2006;15(Suppl 3):iii59–64.
. The top 10: Packaged Beverages, Beer and Foodservice Expand Share of Inside Sales. (State of the Industry Handbook 2007). CSP Information Group, Inc, 2007. http://www.cspnet.com/Media/PublicationsArticle/SOI07-F8-top10.pdf (accessed 5 Apr 2012). BBC News. Minimum alcohol price planned for England and Wales. 23 March 2012. http://www.bbc.co.uk/news/uk-17482035 (accessed 5 Apr 2012). Scottish Government Web site. Alcohol Minimum Pricing. 2012. http://www.scotland.gov.uk/Topics/Health/health/Alcohol/minimum-pricing (accessed 5 Apr 2012).
. Model-based Appraisal of Alcohol Minimum Pricing and off-licensed Trade Discount Bans in Scotland Using the Sheffield Alcohol Policy Model (v.2): Second Update Based on Newly Available Data. ScHARR, University of Sheffield, 2012. http://www.sheffield.ac.uk/polopoly_fs/1.150021!/file/scotlandupdatejan2012.pdf (accessed 5 Apr 2012).
. Commentary: on Ross et al. (2011): Beyond cigarette taxes—the need for research on other cigarette pricing policies. Addiction 2011;106:620–1. Board of Licenses. New City of Providence Tobacco Sales Laws. Official Website of the City of Providence Rhode Island, 2012. http://www.providenceri.com/license/new-city-of-providence-tobacco-sales-laws-0 (accessed 5 Apr 2012). Funding This work was supported by award number 200-2008-F-24376-CDC NCCDPHP from the Centers for Disease Control and Prevention. Data sharing statement Citations and full text of US state cigarettes minimum price laws are available from the authors.